FOR THE LOVE OF TWINKIES! I am actually writing you this edition of my weekly article while I have been speaking to the students at the Dalat English Speaking Christian School in Penang, Malaysia. All week long I have had the privilege of speaking to young people aged all the way from Pre-K to the Seniors in High School. My theme as been “Bold Moves!” Bold Moves is when God asks you to do something that you can’t do without him, but together- miracles happen! “Bold Moves” proves that we desperately need a little divine assistance if we are ever to truly capture the specific meaning and intentional reason of why we have been placed here on planet Earth! God purposely made us to function as the sheep of his pasture because of all the creatures in the animal kingdom- there is nothing very intimidating about a lot of lambs gathered together! They are not hunters! They are not predators! They are not fierce in any way shape or form. And on their own- they will end up as tomorrow’s meal of mutton! But when God inhabits the flock- the fire ignites a passion that would have never been there otherwise! Super Sheep only come to be with the aid of a Super Savior! And Jesus didn’t save us to just become a professional bench warmer. Jesus didn’t die for us just so that we could use his blessings to accommodate our own agenda! God has a work to do with you in mind. He has literally put your name on something that no body else will ever do as well as you! Your mission if you choose to accept it is to trust his presence and enter fully in to the adventure together! And it isn’t what you might think! God is not recruiting you to become something that you were never equipped to pull off. The simplest way to discover the Lord’s itinerary for your efforts and abilities is to admit what you are passionate about and dedicate it to him! Too many people are stuck doing daily what they hate every second! I don’t care how much money they may be making- money alone can’t buy you love or satisfaction! Are you settling when you should be soaring? Are you playing it safe because you are terrified of failing? Without faith it is impossible to please God! And without faith- you will never try to fly! If you could do whatever you wanted to do- what would it be? Could that stirring of the sparks into flames be God trying to free the fire in you so that the Lord might shine through you? If anyone deserves a little enthusiasm- it is the God of all creation. Don’t you think that he might deserve something a little better from you than yesterday’s leftovers? Why do we tend to always take the Lord for granted? We constantly expect God to come through for us every day- but what about us showing up for him? Why is it that more often than not- we only get around to God when we can squeeze him in rather than make it an absolutely essential can’t miss appointment? If I were to ask you to name all the things in your life right now that get more attention out of you than the moments you make the Lord number one- what would they be? Where does Jesus fall on your hit list? Did he even make your top ten? During the summer before this last one, my brother Robert and I were in New York City for the Major League Baseball All Star Game. We had hardly gotten off the PATH Train when all of a sudden we were bombarded by people singing the praises of what they were telling us was one of the greatest comeback stories in all of history. One individual even went so far as to say that this American “Treasure” had literally risen from the dead! 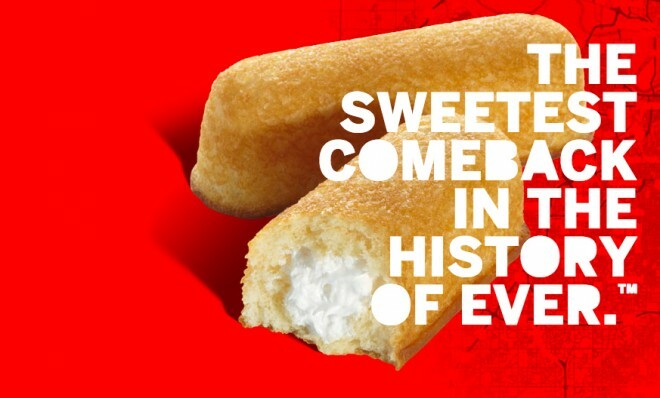 He was talking about “The Twinkies.” Yes, we had almost lost that Hostess snack forever but somebody loved us enough to bring it back to the streets where it belonged. Everywhere we went that day- they were passing out Twinkies- singing about Twinkies and wanting to know if we wanted to accept the Twinkies into our stomach again! Yes, Twinkies, the snack that because of all the preservatives injected into them- never expire! The Twinkies that might encompass the most wasted use of calorie intake ever. How could we ever survive without this jewel of junk food? It was like sugary sweet street evangelism. I ate so many Twinkies that day- I almost wished they had disappeared again for good! It was a Twinkies overload and overkill started by a bunch of Twinkies Freaks who were not content to just keep the treats to themselves! They believed everybody needed to join in the celebration! They invited all humanity to take part of the Twinkies emancipation! What once was lost was now found. What once was nostalgia was the now news to take notice of. How would the world survive without Hostess Sweet Confectionery Fluff? Nobody told me about Jesus that same day. Nobody shared their love for the Lord. Nobody ran up to my brother and I and said that they had found treasure in the bread of life that satisfied in a way that the Twinkies could never touch! Why had mankind elevated Twinkies to a level that it had never deserved to obtain? For me Twinkies are OK. I always loved Funny Bones myself! But no baked cake is ever going to be as big as Jesus in my life and my world! And if I believe that, then there is no way I can keep this eternal treat a secret! And neither should you! So as I head home for Malaysia I know what I am giving this Harvest Season and you won’t find it on the shelf at WaWa! But you will discover that the real resurrection unbelievable comeback story was when Jesus rose from the dead and because he lives- we can too! And I will yodel that until every ring dings!!!! I am with you P.Rudy! Funny Bones top the Twinkies! God Bless you as you share the Gospel boldly…and safe return to NJ!